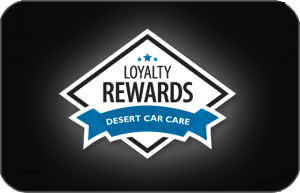 LOYALTY = REWARDS AT DESERT CAR CARE! WHY JOIN? Become a Desert Car Care rewards member today! Every card is Pre-Loaded with HUGE SAVINGS! Plus earn rewards on future purchases. To become a Desert Car Care Rewards Card Member, simply fill out the form on this page and we will send you a personalized Rewards Card. In addition to accruing points on every purchases on your card, Rewards Card Members also receive bonus offers reserved only for Rewards Card Members. Program Details: Desert Car Care Rewards valid at Chandler location only. This is not a credit or charge card; this card identifies the holder as a Rewards Club Member. Valid on sales and service purchases only. Present or let your sales or service consultant know that you are a Rewards Club Member to earn your Rewards Club Points off each dollar you spend. Your points can be used toward future purchases only. Not redeemable for cash. Not valid toward prior purchases or repairs. Desert Car Care can modify or cancel this program at any time without notice. Excludes state and local taxes, sublet services,warranty and insurance deductibles and environmental fees. Valid on most vehicles, excludes Commercial/Fleet. Other restrictions may apply, please call or see your Store Manager for details. Copyright 2015. All rights reserved.